276, Flower of Aurantium Limeta (Lime-tree); stamens in five sets. 277, One of the sets. 278, Flower of Hypericum AEgypticum; stamens in three sets. 279, Flower of Tecoma radicans; petals cohering into a tube, free only at top. 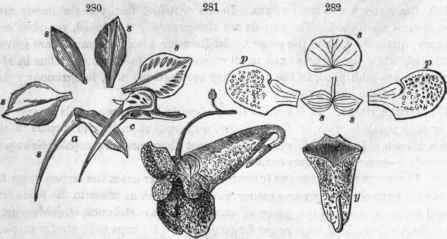 Sepals also coherent. 435. 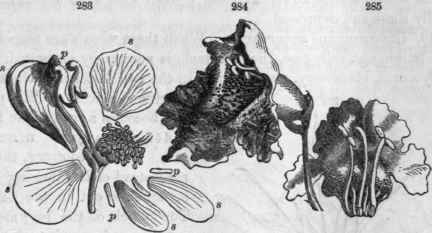 Scales are attached to the inner side of the corolla, usually upon the claw of the petals, as in butter-cups, or within the throat of the corolla tube, as in the Borrageworts. Similar appendages, when enlarged and conspicuous, constitute a crown in catchfly, corn-cockle The flowers of Narcissus are distinguished by an excessively large crown or corona, with its parts all blended into a tube or rim. Flower of Delphinium Consolida (common larkspur), displaying, 8, 8, 8, 8, 8, the five sepals, «, the upper one spurred; c, the corolla of four petals here united into one and produced into a spur. 2S1, Flower of Impatiens fulva (touch-me-not). 282, Displaying, S, 8, 8, y, the four sepals, 8, the anterior one, being probably double, and y, saccate and spurred; p, p, the two petals, both double. 436. Glandular bodies are often found upon the receptable in the places of missing stamens or carpels, or as abortive organs of some kind. Examples are seen in the Crucifers and grape. In grass-Parnassus they are stalked and resemble stamens. 437. Union of organs. This condition in some way occurs in almost every flower, and more perhaps than any other cause tends to disguise its plan and origin. The separate pieces which stood each as the representative of a leaf, now, by a gradual fusion, lose themselves in the common mass. Nevertheless, marks of this process are always discernible either in parts yet remaining free, or in the seams where the edges were conjoined. The floral organs may unite by cohesion or adhesion. 438. Cohesion, when the parts of the same whorl are joined together, as the sepals of the pink, the petals of morning-glory, the stamens of mallows, the carpels of poppy. 439. 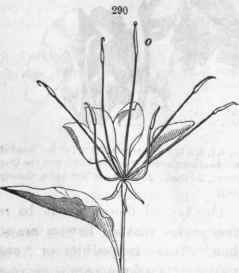 Adhesion, when the parts of different whorls are conjoined, as the stamens with the corolla in phlox, with the pistils in milkweed, ladies' slipper; or calyx with ovary in apple or wintergreen (Gaultheria). 440. The adjective free is used in a sense opposite to adhesion, implying that the organ is inserted on (or grows out of) the receptacle, and otherwise separated from any other kind of organ. The adjective distinct is opposed to cohesion, implying that like organs are separate from each other. This subject and also the next will be more particularly noticed in another chapter. 283, Flower of Aconitnm Napellus displayed; 8, 8, 8, 8, 8, the five sepals, the upper one hooded; p, p, p, the five petals, of which the two upper are nectaries covered by the hood, and the three lower very minute. 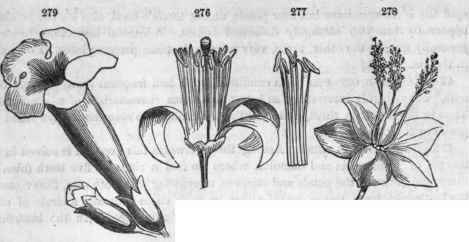 2S4, Flower of Catalpa, 2-lipped, 5-lobed. 285, Corolla laid open, showing the two perfect stamens and the three rudimentary. 1. In the unequal size of like organs (petals of mullein). 2. In their dissimilar forms or positions (petals of the pea). 3. In the unequal cohesion of like parts (petals of Lobelia). 4. In unequal suppressions (stamens of the Labiate flowers, where, indeed, as in many other flowers, all these phases of irregularity are combined). 2S6, Flower (magnified) of Myosuras; a vertical section showing its elongated receptacle, etc. 287, The same, natural size. 283, Flower of Isopyrum biternatum; vertical section, showing the convex or globular receptacle, etc. 2S9, Flower of rose, showing its excavated torus. 442. The regular receptacle has no internodes. It bears the several whorls of the flower in close contact with each other, and is usually short and depressed. 443. Lengthened receptacle. When these whorls are numerous, as in buttercups, tulip-tree, the receptacle is necessarily elongated. So in Myosurus, blackberry, strawberry. In the two latter it imbibes the nutritious juices of the plant and becomes a part of the fruit. 444. Excavated receptacle. On the contrary, the torus instead of lengthening may be hollowed out in the center. The carpels of the rose are situated in such a cavity, while the other organs are borne upou its elevated rim. In Nelumbium the carpels are immersed in as many separate excavations in a large, fleshy receptacle. 445. 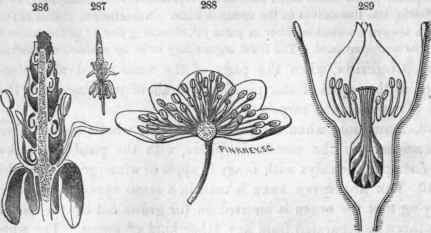 But the internodes of the torus are sometimes developed, e. g., in noble liverwort a short inter-node between the corolla and calyx has changed the latter (technically) to an involucre. In the pink a similar inter-node renders the ovary slipitale. In the Caper family the torus is developed into long internodes, sometimes raising the ovary upon a long stipe, sometimes the stamens and ovary. 290, Flower of Cleome pungens, showing its ovary, o, mounted on a long stypo. 44V. Combined deviations are quite frequent, and sometimes obscure the typical character of the flower to such a degree as to require close observation in tracing it out. The study of such cases is full of both amusement and improvement. 448. For example, the V poppy has suppression in the calyx, multiplication in the stamens and carpels, and in the latter cohesion also. The 5V sage has cohesion and irregularity in the calyx, every kind of irregularity in the corolla, suppression and irregularity in the stamens, suppression and cohesion in the pistils. The V Cypripediura is perfectly symmetrical, yet has irregular cohesion in the calyx, great inequality in the petals, cohesion, adhesion, and metamorphosis in the stamens, and cohesion in the carpels.